McPherson definitely deserves credit for being an entertaining playwright. He never gets too difficult or highbrow, yet he has a fine grasp on how to craft a good story. His characters might not be the most complex, but the unfolding events keep you glued to the page. And like a lot of good scribes, he has a solid, dry wit that is sprinkled liberally throughout. His main weakness is that his characters tend to speak in monologs. All but one of these plays are monologs, and even in the one that is not, the characters break off into long narrative bits. McPherson may not be a great writer, but he is an enjoyable one. "The Weir" is superb, clearly the best thing in this collection. It is about a handful of characters in a pub in the Irish countryside, drinking and telling some ghost stories. As the play winds down, it dawns on the viewer that the real ghosts we have to struggle with are those within our hearts and minds. The piece plays brilliantly with the viewers expectations. I would love to see a good performance of it someday."St. Nicholas" is also very good, and wickedly funny too. It is a first person monolog from a hard drinking, sardonic theatre critic, who creates a wild evening while trying to chase down an actress he falls for. He ends up in a very strange situation involving a group of vampires. There are many good laughs here, and interesting insights. Like "The Weir", it presents a dry take on the occult. "This Lime Tree Bower" was nothing great. Three young men tell their stories in series of monologs that seem to come straight out of an Irvine Welsh book - blue collar youths, a little crime and drunkenness. "The Good Thief" is also very much in the crime fiction vein, and features a petty thug who ends up going on the lam. "Rum & Vodka" is more fun than the previous two - it is another first person monolog full of drinking and debauchery. This time the protagonist is a regular Irish fellow who throws his computer out of his office window and goes on a week-long bender, ditching work, wife, and children, and finding a little extra-marital action as well.It is not hard to get a grasp on McPherson's popularity. This is solid, rambunctious playwrighting, and "The Weir" really is a special piece. Admittedly, for me, this fellow's work is hard to lift off the page. Granted, he directs all of his own plays, so that makes a tremendous difference. That said, the characters and their dialogue are so specific and well written that you really believe who they are. The problem is not what is being said, but what the play is about. None have what you can call a plot. It is all about the internal machinations and reckonings (or not) of the characters. I have read the plays twice now and still have not been able to grasp the full intent of the playwright. I could not find the places where I was supposed to be moved, or to have a revelation, or get the feeling of some kind of 'shift' in the text. I understand from reading critical analysis of his work that a lot has to do with the 'feelings' you get as you witness the performances. Well, that's the magic of theatre, isn't it? Perhaps the meaning should not be derived from the page at all, but from the experience. I'd love to see one just for that. But because I could not find those feelings for myself as I read them, I can only give this volume three stars. Drama pitched perfectly. Here are stories you'd overhear in the bar, fervent voices and eyes desperate to make contact, shaking hands and stories that need to be told --- the catch, of course, that even just telling a story is "full of mischief," as McPherson writes in his brief note to St. Nicholas. McPherson's plays work best on the page when a mixture of immersion and interaction carry the reader into the world: this can happen in ensemble pieces such as The Weir (undoubtedly the best piece here, itself a masterclass in how to tell conventional ghost stories to those you do and don't know), but also in sequential tale-telling, such as in This Lime Tree Bower (another stand out). Monologues such as St. Nicholas live and die on the perceived relatability of the character telling them, and for this plays it comes off well enough, though neither The Good Thief or Rum and Vodka fares quite as well. All in all there's plenty to enjoy here in various forms of expression---and that's cause enough for celebration. 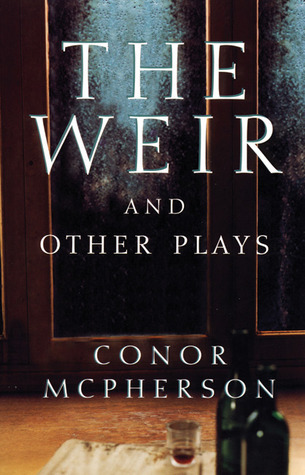 If you are interested in Irish ghost stories, The Weir is an excellent play! I haven't read the other plays in this collection, in part because they are all monologues/soliloquies, so my rating is only for the Weir. The Weir is an appropriate warm-up for The Eclipse, a new movie written and directed by the same author, which is funny and frightening in equal portions. Weir scared the crap out of me and made me cry. So i loved it. Some of his other plays, especially the monologues, i did not get into as much when reading- i heard they are wonderful when performed. My friend Mohamed let me borrow this book, and i think i forgot to give it back before I left the state of california. sorry mo. Originally I picked this up for the title play (which I was auditioning for). But I enjoyed that one so much that I am reading the others through. And since they are mostly monologues, they read more like novels than plays. The Weir was the better play out of them all, but the characters were kind of stagnant. They just didn't go anywhere. All the other plays had such miserable characters. They just were not enjoyable to read. Loved this. Love his story-telling ability. Conor McPherson is a favorite and I was glad to be able to look at some of his older works. He's got such awesome talent, it's incredible. Scariest play of the 1990s. Also a gentle meditation on Ireland as a place where the dead and living sit down together for a drink. A very thin place. I enjoyed reading these plays. A bit odd, but interesting. I like watching plays rather than reading them, and I'm sure on stage these would be great - but a decent read nonetheless. Conor McPherson - Conor McPherson is an Irish playwright and director.